Ben Crocker kicked three goals in his first full game back after an injury-interrupted pre-season. Photo: Shane Barrie. Collingwood’s VFL side learnt a few lessons from Thursday’s pre-season loss to Richmond, according to coach Jared Rivers. The Magpies were outclassed by a Richmond outfit with 17 AFL-listed on the field, losing 10.6 (66) to 20.10 (130). After an even first term, the Tigers kicked away with 14 goals to five in the remaining three quarters. “It was a tough day of us,” Rivers said post-game. The VFL Magpies won’t face Richmond again until late June, but are steadily preparing for a season opener against Coburg in a fortnight. Rivers believes the review of this loss will help the club find success when the home and away season kicks off. After a uninspiring performance through the middle of the game, shock went through the Collingwood camp when Mason Cox limped from the ground after a big collision in the final term. The big man was assessed by trainers before returning to the field to play out the final moments of the game. “He copped a whack on the leg. It didn’t look good early, but he came back on and pulled up alright,” Rivers said. Despite the disappointing performance, the coach was impressed with two AFL-listed Magpies – one at either end of the ground. With the ball coming in thick and fast, Matthew Scharenberg was used as a loose man in defence, while Ben Crocker was electric in the forward line. “His aerial work was really strong and his decision with the ball in hand was really good,” Rivers said of Scharenberg. “Crocker was really good. His work rate is really important for our team. “If he can build on his fitness and keep his energy up at the level it was today, he can be important for us, but also the AFL team. The VFL Magpies will meet North Ballarat at the Holden Centre next Saturday to conclude their pre-season campaign. 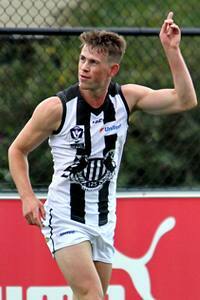 Josh Thomas impressed in the midfield in the VFL Magpies' loss to Richmond at Punt Road Oval. Photo: Shane Barrie.